I knew Beard Papa's was going into the new wing of San Francisco Centre back in June, when I wrote about the local franchises of the Japanese chain. But untill today, reading the bazzilionth roundup of Centre restaurants in tablehopper, the full absurdity of the location did not dawn on me. 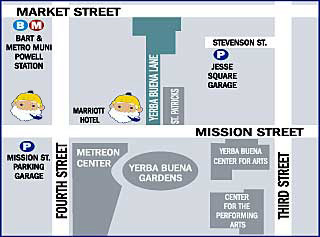 Beard Papa's debuted in San Francisco on Mission Street and Yerba Buena Lane, about half a block from Fourth Street. The second local location is going in to the Centre's expansion on Mission toward Fourth -- less than a block away. Of course, if you eat enough cream puffs that can start to seem like quite a distance.